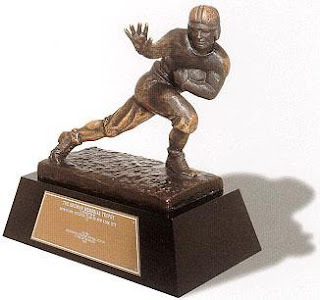 The Heisman Trophy is the most prestigous trophy a collegiate athlete can hold in any sport. Every year NCAA Division I-A's biggest football superstar is awarded this trophy. This year's winner will be the 74th. In 1935 Jay Berwanger was awarded the first Heisman trophy and since then the trophy has been given to notable stars such as O.J. Simpson, Earl Cambpell, Vinny Testaverde, Barry Sanders, Reggie Bush and many more. This year in 2008, there isn't a reason to think there is going to be too many surprises when it comes time to hand out the beautifully bronzed trophy. 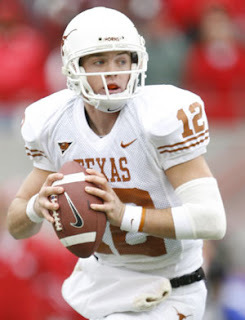 Texas quarterback Colt McCoy is a huge favorite. Predicting Colt McCoy is going to win the Heisman Trophy this year is like saying, "well you know, I think the sun is going to come up tomorrow." McCoy has played exceptional football all season and has led the Texas Longhorns to the top of the Bowl Championship Series (BCS) Standings. McCoy is a threat to run and pass when he has the ball, just ask his opponents. Those who have had the unfortunate pleasure of dealing with Colt, have surrendered 21 passing touchdowns and seven rushing touchdowns this season. Some have handled him better than others, but they all have one thing in common, they all lost. McCoy and the Longhorns have victories over highly ranked conference opponents such as Oklahoma, Missouri and Oklahoma State this season; and head across Texas to take on their in-state, No. 8 ranked rivals, Texas Tech. In past years it has been hard to determine who the best team and player are in College Football, but this year is quite different. With one of the hardest schedules of any team across the country and convincing wins over three Top-10 teams, its clear that Colt McCoy and the Longhorns are no long-shot to take home all the hardware this season.